It is almost Strawberry season. One of my favorite times of the year and one of my favorite fruits. I have picked up several batches already and they are pretty sweet. We do not have local grown strawberries yet but the ones coming in from California are pretty tasty. In the United States, over half of the three billion pounds of strawberries grown each year comes from California, with Florida a distant second. Strawberries are full of antioxidants, vitamins, minerals and fiber and are the the fourth most consumed fruit by weight in the United States in 2017. They follow bananas, apple and grapes respectivley. 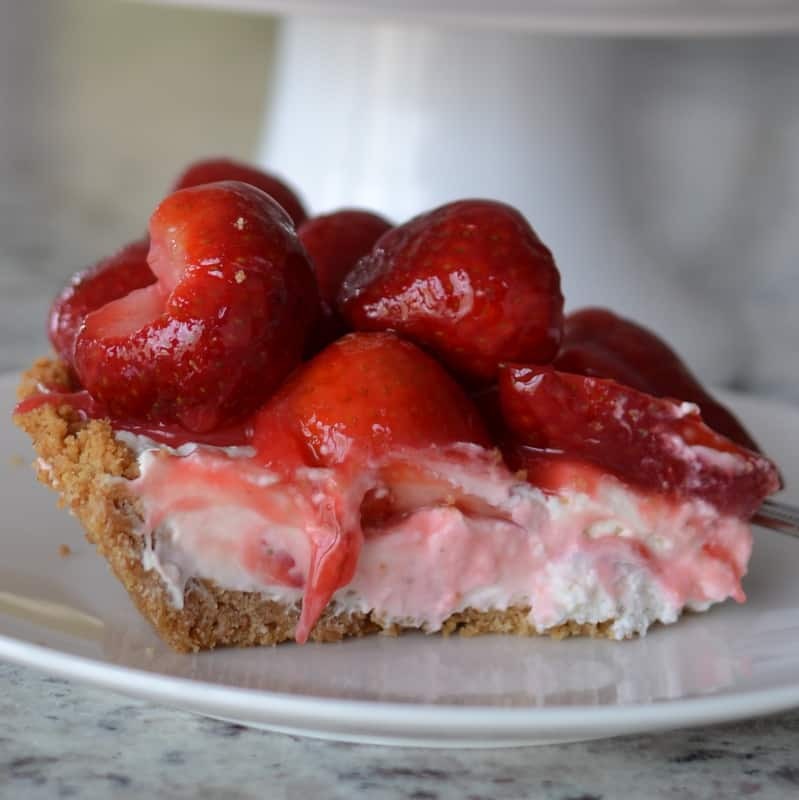 I love strawberries and this Strawberry Cheesecake Pie is perfect for your holiday celebrations, birthday parties, neighborhood soirees and potlucks. 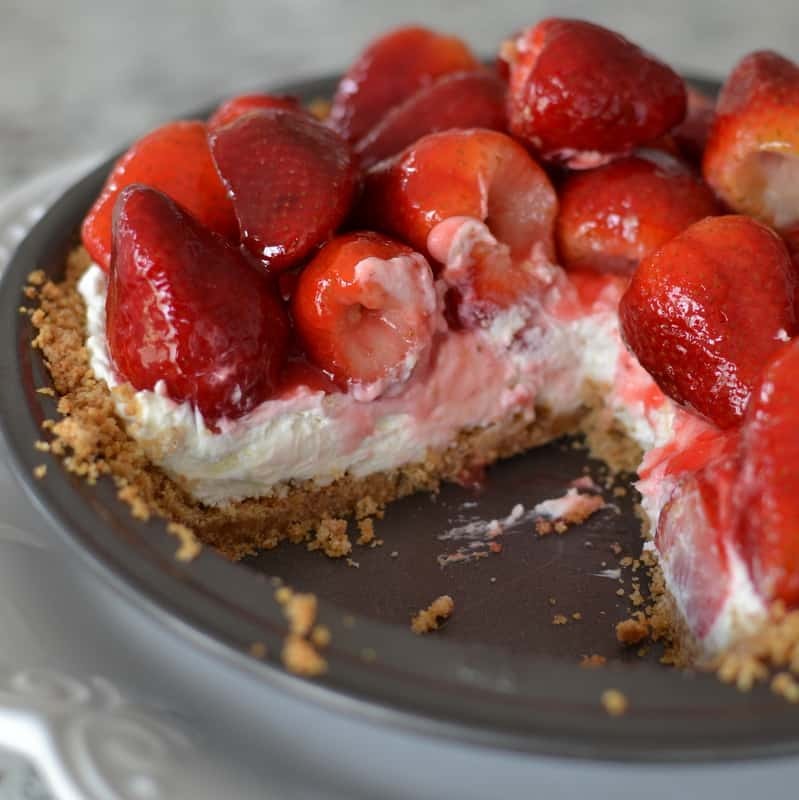 This delectable beauty brings cream cheese and whipped cream together perfectly in a fresh graham cracker crust topped with glazed fresh strawberries. Are you a strawberry lover too? Easy Lip Smacking Strawberry Lemonade, Easy Homemade Biscuit Strawberry Shortcake and Strawberry Bacon Salad with Honey Poppy Seed Dressing are just few of my favorite strawberry recipes. These Strawberry Shortcake Bars from Baking Beauty are a fellow blogger family favorite. 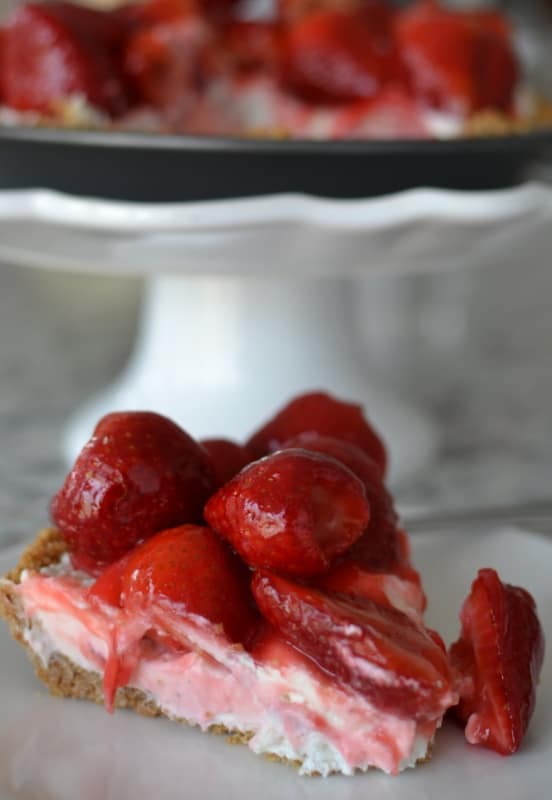 Strawberry Cheesecake Pie is a cinch to make. Are you super pinched for time? You can make the crust ahead of time and freeze the prepared baked crust in the pan wrapped for up to 3 months. Thaw at room temperature unwrapped before using in this recipe. You can also prepare and bake several days in advance and store wrapped in the refrigerator. If preparing the whole pie a day or two in advance hold off on the glazed strawberry topping until closer to serving. This Strawberry Cheesecake Pie is scrumptious. My darling daughter just had a large piece. I asked her several questions while she was eating. She did not answer a single question because she was shoveling pie in her mouth to fast to answer the questions. Stir together graham cracker crumbs, 1/4 cup sugar and melted butter. Firmly press crumb mixture into bottom and up sides of a 9-inch pie dish. Bake at 350 degrees for 8-9 minutes. Remove from oven and cool for 30 minutes. Using mixer beat cream cheese until smooth. Add vanilla extract and powdered sugar and continue mixing until smooth. In separate bowl whip cream until soft peaks form. 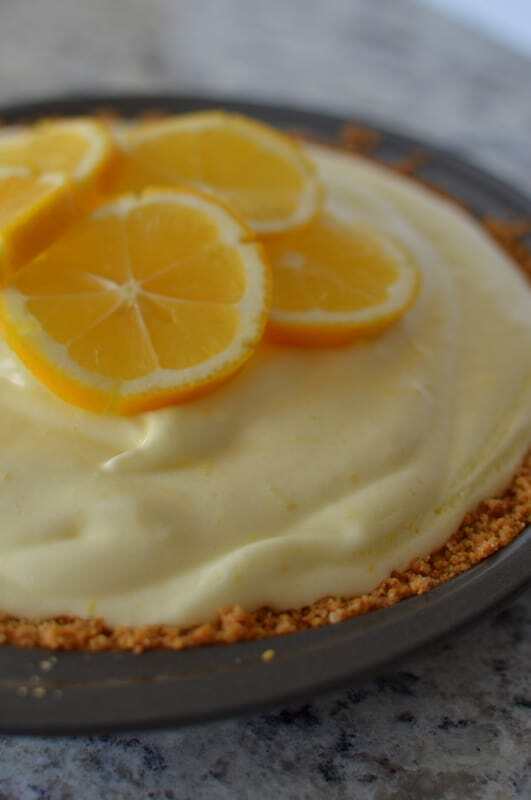 Fold into cream cheese mixture and carefully spread in baked crust. Chill for 1-2 hours. In small saucepan whisk together cornstarch, 1/4 cup sugar, strawberry gelatin, water and lemon juice. Cook over low heat whisking constantly until thickened. Remove from heat and allow to cool to for 10-15 minutes. Add strawberries to the pan and stir to coat. Layer glazed strawberries over the pie. Refrigerate until ready to serve. 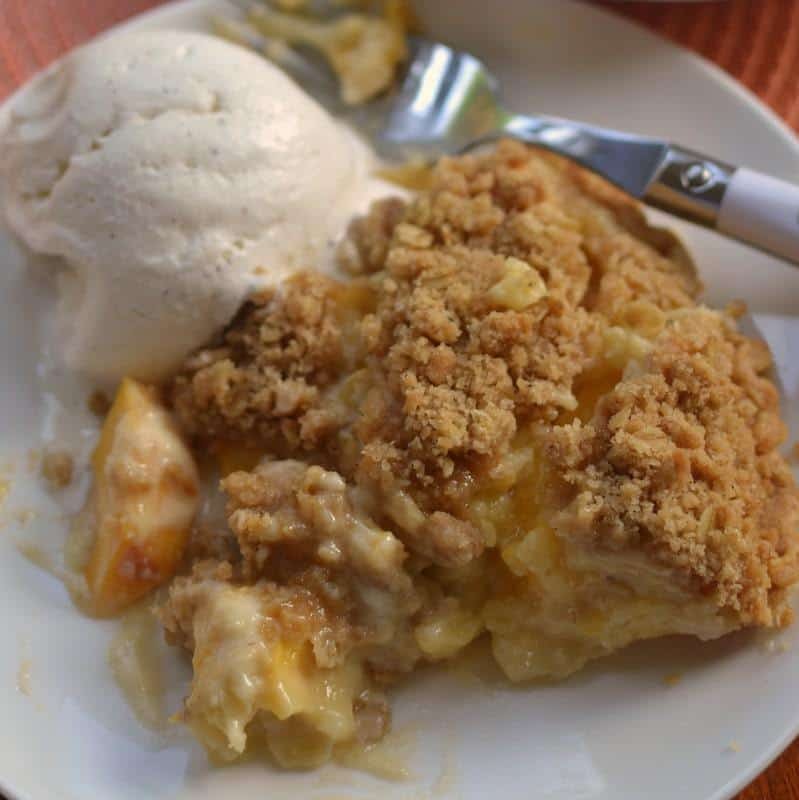 Other scrumptious pies you will love! !